Since late January when a blizzard covered the region in snow, storms have continued with no apparent end in sight. Much like waterfowl flock to unfrozen estuaries as the only reliable food source in winter when ice forms over waterways, songbirds flock to feeders for an easy meal when the snow gets deep. In addition to the usual feeder species generally present in winter, other species which visit feeders less frequently have been observed over the past two weeks. These have included American Robin, Hairy Woodpecker, Eastern Towhee, Purple Finch, Carolina Wren, Red-winged Blackbird, Fox Sparrow, and American Tree Sparrow. Of this group, American Tree Sparrows generally arrive from further north, Carolina Wren and Hairy Woodpecker are resident species that increase at feeders during harsh conditions, while the rest are short-distance migrants. This last group includes American Robin, Eastern Towhee, Purple Finch, Red-winged Blackbird and Fox Sparrow, whose populations “shift” in winter. During these shifts more northerly birds are often the ones that appear at feeders and replace the nesters, which have moved south. One species is unambiguously a true bird of the north that migrates this far south from the Canadian boreal forests only in approximate two-year cycles called “irruptions” (similar to Snowy Owls), when crops of conifer seeds and catkins are poor. Over the past week, a Common Redpoll (Acanthis flammea) (pictured) visited the feeders to feast on sunflower seed. This species (following a similar trend to Pine Siskins) takes advantage of feeder stations in the lower 48 states during periods of food scarcity in the far north, sometimes invading feeders in large numbers. Redpolls are distinguished from other finches by the dark red cap and black chin marking. 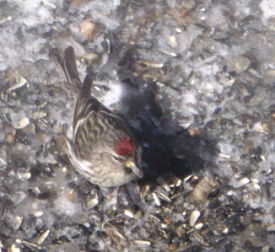 Redpolls sometimes adapt to cold by tunneling into snow and creating an insulated cave! (Cornell Ornithology newsletter, winter 2015 issue). Stop by the Lloyd Center to see what other rarities might show up in this wild winter we’re having!